*You can ask the butcher at the meat counter for ground veal if you cannot find it in your meat section. Or, you can substitute pork or ground beef for the veal if you cannot get veal. The veal, however, does add to the flavor.Melt 2 tablespoons butter in large skillet over medium heat. Add onion. Cook and stir 8 – 10 minutes or until onions are very soft. Remove from heat and set aside.Combine beef, veal, pork, bread crumbs, beaten eggs, salt, pepper and nutmeg in large bowl. Add onions; mix well. 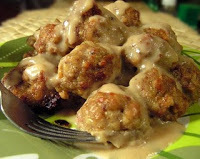 Shape into balls (use 2 tablespoons of meat mixture for dinner-sized meatball or 1 tablespoon for cocktail-sized). Set aside.Preheat oven to 200 degrees. Reheat skillet over medium heat. Add 1/4 to 1/3 of meatballs. Do not crowd pan. Cook 8 minutes, shaking pan to allow meatballs to roll and brown evenly. Reduce heat to medium-low. Cook 15 – 20 minutes or until cooked through. Transfer to covered casserole dish and keep warm in oven. Meanwhile, wipe out skillet. Melt remaining 2 tablespoons butter over medium heat. Whisk in flour, stir well. Combine milk, half-and-half, egg yolk, and salt in a small bowl. Slowly stir into the flour mixture. Reduce heat to medium-low. Cook and stir 3 minutes or until thickened. Remove dish from oven and pour sauce over meatballs. Place on serving platter, garnish with parsley, and serve immediately, or place in crockpot on low for a buffet. These are also wonderful as a main dish served over hot, buttered noodles.Makes 72 cocktail-sized meatballs.This recipe, and 349 others can be found in our cookbook “Rocky Mountain Lodge & Cabins Favorite Recipes” which can be purchased in our Gift Shop. Click Here to order your copy. This entry was posted in Uncategorized and tagged Appetizers, Dinner Recipes, Party Food by Debbie Reynolds. Bookmark the permalink.